Tosin Silverdam, a blogger who criticized the appearance of Adesua Etomi on Vogue Magazine cover, has apologized to her. In his apology note, the blogger stated that his criticism of the magazine cover was misconstrued by many as an attack on the actress. It’s quite obvious people took my criticism the wrong way. I’m so sorry if you all didn’t get my point. Well, I apologize for my opinion. I apologize to @adesuaetomi and her fans, especially her fans cos it’s glaring they didn’t see the positive sides to my critic. But honestly speaking I am not a hater, what is there to hate? Hate that she’s on the cover of @voguemagazine? Stop tagging everyone a hater. Jealous of her success? Why would I? People called me a low life, some said I have not achieved anything in life, so I must have achieved a lot in life before I can critic? I didn’t call her a slave, I only said she look like a slave in the picture compared to the other ladies, why darken her skin tone to make her look black. It is ridiculous, they could have gone for another actress that is so black. Can you guys just compare her @genevievemagazine cover to that of @voguemagazine. 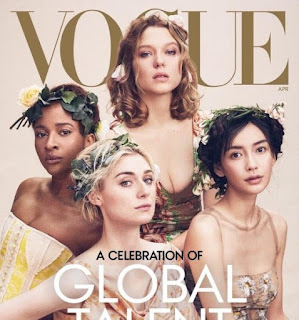 I am surprised some people didn’t find anything wrong with her skin tone on this cover because it’s Vogue magazine. This is a big achievement for @adesuaetomi, I love her, I am happy for her and a big fan but I am disappointed with this cover. I am not biased, she looks so odd compared to others. Then some people said I’m trying to bring her down, haba, how can I bring down someone God has blessed already. Nigerians take a chill pill, it’s just an opinion. Even though I am not supposed to apologize for airing my opinion but I guess I have to cos it was taken the wrong way and already perceived as a hater… Hater?